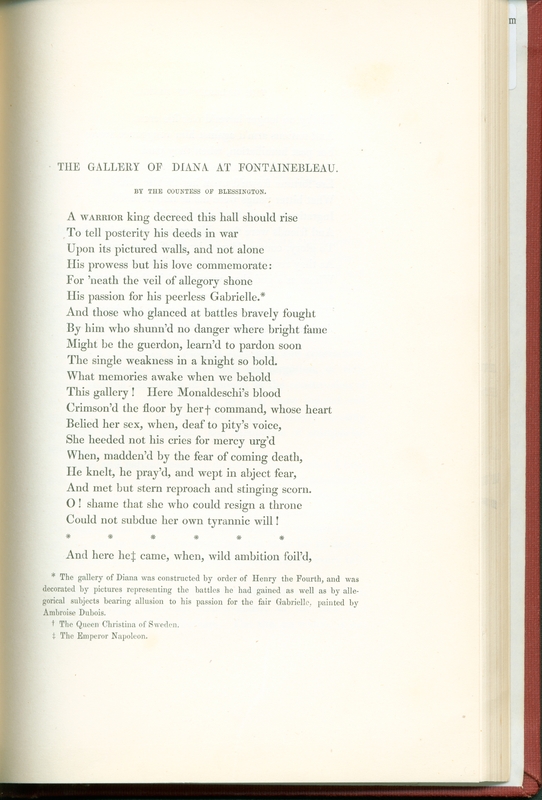 “The Gallery of Diana at Fontainbleau” is a poem by the Countess of Blessington (née Marguerite Power) appearing in the 1848 Keepsake. 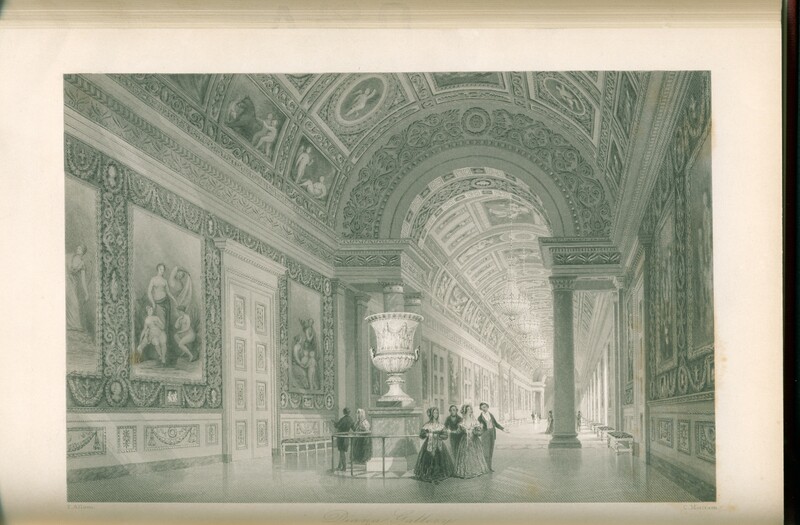 It accompanies a plate engraving by T. Allan depicting the vast interior of the gallery at the royal French chateaux Fontainbleau and foregrounds two women viewing the artwork within. The women are diminutive in comparison to the scale and decadence of the surrounding sculptures and paintings. In contrast to the engraving’s focus on the feminine and the act of looking, the poem is rich with bold and bloody martial imagery depicting: Henry IV, the “warrior king”; Queen Christina of Sweden and the execution of Gian Rinaldo Monaldeschi; and Napoleon’s farewell to his generals following his abdication. In addition to the Keepsake’s status and wide circulation, the popularity of “The Gallery” should also be understood in terms of Lady Blessington herself. The Keepsake, one of the definitive gift books, enjoyed an annual circulation of 15,000 (Erickson 29). Largely marketed to young women, it was feminized by both its readership and its status as a pretty material object. Similarly, Lady Blessington, editor for both the Keepsake and Heath’s Book of Beauty, was an accomplished author and prominent social figure renowned for her beauty. She was also one of the most successful and highly paid editors of literary annuals after taking over the Keepsake from 1841 until her death in 1850 (Kooistra 396). Critic Ann R. Hawkins argues that the discourse surrounding Blessington in literary reviews consistently parallels her personal grace and beauty with the embodied material beauty of her books, suggesting that her public persona influenced the marketing and consumption of her products (65). The gift book’s unique, feminine visual focus was understood in opposition to normative poetry publication. Contemporary critiques of the annuals concerned the debasement and feminization of poetry publication, specifically through a striking presence of plate engravings; in 1846, Wordsworth even suggested that annuals represented a “dangerous femininity undermining a noble masculine culture” (Kooistra 395-396). These critiques of the artistic and cultural legitimacy of annuals would contribute to their complete decline by the late 1850s. 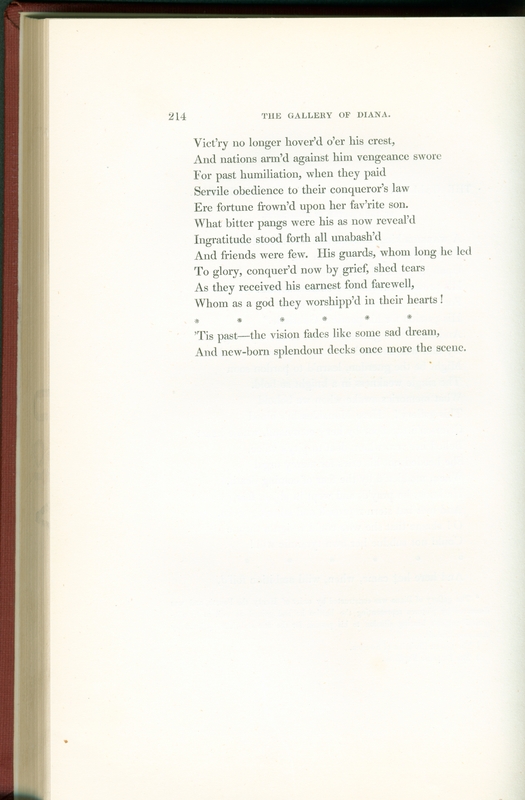 It became typical for the editors (who were often female) to resort to writing the verse for the expensive, pre-ordered engravings that highlighted the volume; the task of writing poetic accompaniment was considered subordinate, leaving the editor creatively and financially responsible for their production (Erickson 31). Understanding the context of the Keepsake’s publication informs the tension between the “The Gallery” and its engraving. Lady Blessington’s depiction of the historical and artistic legacy of Fontainbleau reflects the gendered tension between visual and written art surrounding increasingly critical opinions of gift books. There is a stark contrast between femininity, delicacy and admiration in the engraving, versus masculinity, power and fame in the imagery of the verse. The poem describes the sentimental experience of viewing the gallery: “What memories awake when we behold / This gallery!” (11-12). In addition to bold depictions of grief and gore, of Monaldeschi weeping “in abject fear”, the speaker glorifies the “prowess”, “tyrann[y]” and “wild ambition” of the heroes. The historical figures are not only immortalized in the art, but by their very presence, when the speaker reiterates that “here Monaldeschi’s blood / Crimson’d the floor by her command” and “here he came, when, wild ambition foil’d” (12-13, 21). The presence and violent sentimentality of the verse foregrounds the pathetic gallery experience. By rooting the figures in history, war and violent emotion, they are rendered as distinctly other to the female reader. This separation appears in the last stanza of the poem, as “the vision fades like some sad dream, / And new-born splendour decks once more the scene” (33-34). The gentle, sad fading of the imagined scenes feminizes the viewer and the diminutive figures of the engraving, drawing attention to the female gaze. The gallery and the poem become a safe vantage point for a female audience to witness the power and horror of war. Hoagwood and Ledbetter argue that the overt sensuality typical of Keepsake illustrations offers opportunities for readers to explore a “vicarious sensuality” through the subversion of the male gaze (100). Similarly, the contrast between the engraving and the verse of “The Gallery of Diana at Fontainbleau” highlights the female gaze and its pursuit of sensational escapism through the masculinised other. Instead of feminine sexuality, the desired foreign experience is the violent passion of war. His passion for his peerless Gabrielle. The single weakness in a knight so bold. And met but stern reproach and stinging scorn. Could not subdue her own tyrannic will! Ere fortune frown’d upon her fav’rite son. Whom as a god they worshipp’d in their hearts! And new-born splendour decks once more the scene. Blessington, Countess of. “The Gallery of Diana at Fontainbleau.” Keepsake. Ed. The Countess of Blessington. London: David Bogue, 1848. Print. Erickson, Lee. The Economy of Literary Form: English Literature and the Industrialization of Publishing, 1800-1850. Baltimore: Johns Hopkins UP, 1996. Print. Hawkins, Ann R. “The Portrait, the Beauty, and the Book: Celebrity and the Countess of Blessington.” Women Writers and the Artifacts of Celebrity in the Long Nineteenth Century. Ed. Ann R. Hawkins and Maura Ives. Burlington: Ashgate, 2012. 49-78. Print. Kooistra, Lorraine Janzen. “Poetry and Illustration.” A Companion to Victorian Poetry. Ed. Richard Cronin, Alison Chapman and Antony H. Harrison. Malden: Blackwell, 2002. 392-418. Print. The gallery of Diana was constructed by order of Henry the Fourth, and was decorated by pictures representing the battles he had gained as well as by allegorical subjects bearing allusion to his passion for the fair Gabrielle, painted by Ambroise Debois. The Queen Christina of Sweden.